I am honored to be invited to give a seminar talk at Riovest & Brightwin securities office to their members and users. The only regret is that I did not share enough with them as there was too much to share. But at the end of my talk, I believe everyone benefitted and took away at least one or two things concerning trading the correct way for consistent results. Those interested for my next coming free seminar talk in Singapore can register at http://www.onlinegurutrader.com/free-seminar/ Limited seminars left for the year so register early to avoid disappointments. Hi fellow traders, OGT made a total profit of US$7981.18 for the past 8 months ending November 2014. That’s over 79% returns in just 8 months with a starting capital of $10000. November profitable results are being updated. A picture speaks a thousand words. See for yourself OGT results as we screen capture it for you to view. Verify Online Guru Trader’s real results by clicking here now. All results are tabulated into a trade history table for ease of viewing and you can view that trade history table by clicking here now. Sign up for our free seminar next year to find out and learn how we did it by clicking here now. 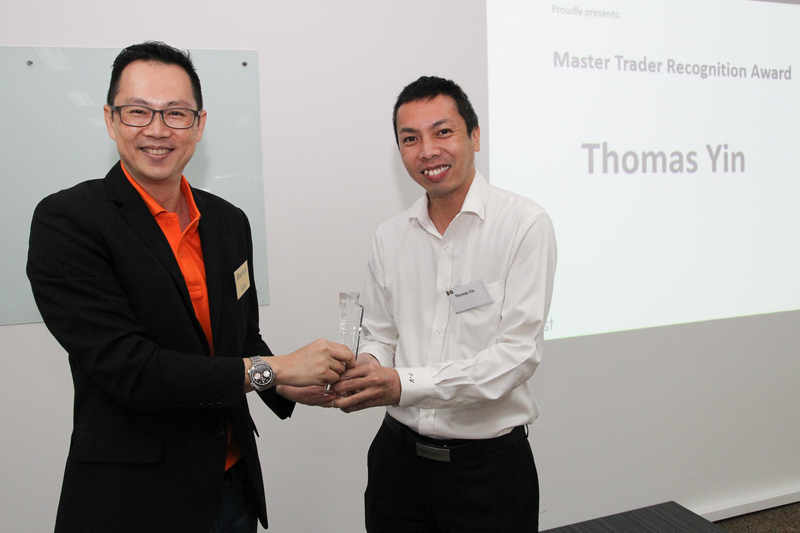 I am really honored and grateful to be awarded the Master Trader recognition award by Brightwin Securities Pte Ltd, a brokerage which offers social trading platform. I like the concept that everyone in that platform are all traders. Successful traders can allow others to copy them and not so successful traders can find successful traders to copy their trades. If they can implement messaging function, then it will be great. It will then really be a facebook of trading. Below is a photo of me receiving the award from Marcus from Brightwin Securities. Just finished my 3 day trip to Jakarta holding 2 seminars talks to aspiring successful traders. Did a radio talk show in Jakarta as well and it was PasFM. I heard PasFM is the number one business radio talk show in Jakarta. Really honored and grateful that I could share my trading journey and expertise through the air the millions of listeners in Indonesia. I was glad that I even had a few minutes to share my trading screen with the radio DJ. It’s my first time in Jakarta to share my trading expertise there. Really grateful and honored to be able to share with the traders there. Below are the photos taken at my seminars and during the talk show. Click on the photos to enlarge for better viewing experience. Went to Bangkok to share my trading expertise to OGT students there. Though I have been to Bangkok numerous times, this is the first time I am there to share my trading expertise. One student even text me one day after the course that he made some profits day trading Thai stocks that day. This is fuel to my passion to share and to help more people out there. Thanks Pisit, your simple text message made my day. Gallery Photos of Online Guru Trader’s Trade To Win course November 2014 Bangkok. Please click on the photos to enlarge for better viewing.